My love will never fail you. But where there are prophecies, they will be done away with. Where there are various languages, they will cease. Where there is knowledge, it will be done away with. The Greek word for love used in this verse is the word 'agape', which is used to describe the everlasting, unconditional love of God. This popular chapter of the Bible is often used as the Scripture reading for weddings to emphasize the power of love. I would encourage you to read the entire chapter of 1 Corinthians 13 as often as possible to remind yourself of the priority of love in God's eyes. Paul the Apostle writes that love is the greatest attribute of God that we can pursue. We can have faith to move mountains, give all our possessions to the poor, understand all mysteries and have all knowledge, and even die a martyr's death, but if we don't have love, it means nothing. 1 John 4:16 simply says that God is love. The very core of His being is an unconditional, everlasting love that continually flows out to us. 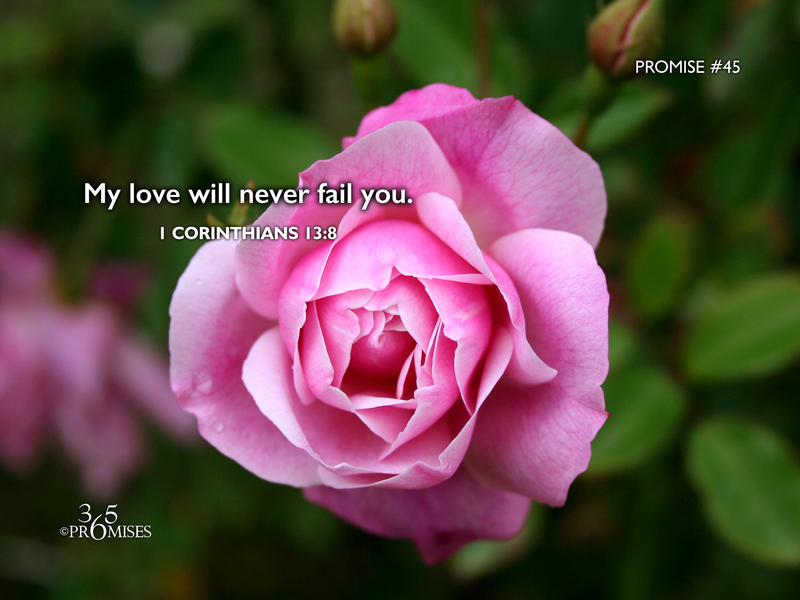 In today's promise the message is short and sweet. God's love will never fail you. Ever. On the day of the year that many people celebrate love (Valentine's Day), may we all be reminded of the greatest of all loves that comes from the Father to us through His Son, Jesus Christ. The love that God has for us will never ever fail. Earthly loves may disappoint us from time to time, but the love that God has for us will never change and will last forever.